Every athlete competing in the Olympic games has an incredibly inspiring story to tell, but some stories simply defy the odds. Take 19-year-old Margret Rumat Rumat Hassan, a 400-meter runner from South Sudan. Hassan is on her way to competing at this year's Summer Olympics in Rio de Janeiro, which is already an impressive feat for such a young athlete. It will also be the first time that her country will be represented in the games after gaining its independence from Sudan in 2011. With such an inspiring story, Samsung couldn't deny that Hassan would be the perfect fit for a new campaign just in time for the Olympics. "The Chant," created by Leo Burnett Chicago, aims to capture the brand's defying the odds attitude, while promoting the Samsung Gear IconX cord-free earbuds. "We wanted to find an athlete that represented progress and defied the barriers and overcame something, to be an embodiment of what the brand is and the mentality of the brand. You can't move forward without overcoming obstacles," Gordy Sang, svp, creative director for Leo Burnett Chicago, told Adweek. The spot follows Hassan as she prepares for her Olympic debut by putting in her wireless headphones and getting herself psyched up to compete. Between shots the viewer sees her country rallying behind her and chanting her name in city streets, which Sang said was an incredible sight to witness during filming. "These actors on set were incredible, it's something you would never see in the states, just the emotion and the power and excitement that they have behind these Olympics is so strong, we just hope it's well received not just globally but amongst them. The hope is that it brings good and it's not just exploiting a story but glorifying them," Sang noted. "The Chant" ends with the tagline, "Do What You Can't," further illustrating the idea of overcoming obstacles in order to achieve one's dreams. 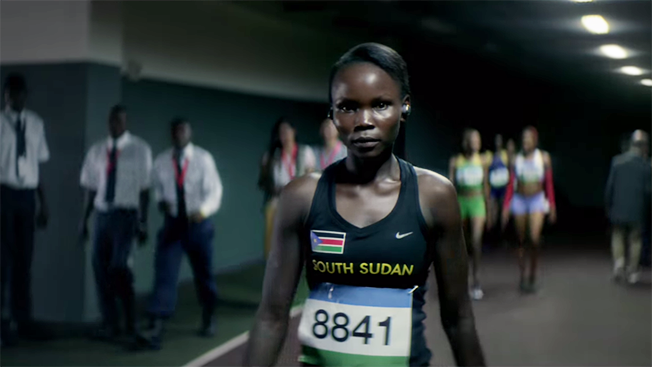 "The fact that South Sudan wasn't a country five years ago and now it's a country and has athletes representing them in the Olympics is 'Do What You Can't,'" Brian Siedband, svp, creative director for Leo Burnett, told Adweek. The idea also fits nicely with the product itself, the wireless earbuds that give consumers the freedom to listen to their music how they want, when they want, without the constraints of wires or smartphones.